American Airlines has some of the best award options for flights around the world. With the American Airline AAdvantage award program, you can fly practically anywhere in the world using miles that you earn from credit card bonuses and flying on American Airline flights. By learning some basics about the program you will be a pro at booking your next award flight. In a series of posts, we’ll discuss the different ways American Airlines miles can be used to maximize your award trips. American Airlines has three award charts that allow you to create some of the most incredible and memorable trips–and ultimately fly you to where you want. With the US Airway and AA merger officially going through soon you will be able to redeem your miles on US Airways flights, and vice versa. The three American Airline awards charts include the American Airline’s Award Chart, one world and Other Airline Chart and the Oneworld Explorer Chart. They each vary on how far your miles will take you on a single award. By taking a look at the charts you can come up with an endless amount of possibilities for trips, especially because you can book with Oneworld alliance partners on 2 of the 3 charts. American Airlines Award Chart is best used for simple round trip traveling, but you can also book multi city trips as well. Although its not limited to domestic travel, it’s best used for domestic flights. American Airlines doesn’t fly many of their own planes to international destinations and with the American Airline Award Chart, you cannot fly with a partner airline. You can however, fly with it’s affiliates which are American Eagle and American Connection. So if you’re planning to book a round trip award, then the Award Chart can be on your side thanks to the different mile saving features it has: MileSAAver, MileSAAver Off-Peak and AAnytime Awards. MileSAAver (midlevel miles): MileSAAver awards are available on Economy, Business and First class and cost the same as the AAnytime Award. The glaring differences are that there is a fee for making changes to your flight and checked luggage on domestic travel with MileSAAver awards, but it does cost less than AAnytime Awards. MileSAAver Off-Peak (fewest miles): Off Peak MileSAAver has limited availability and is only offered on economy award seats. This is a great deal if the travel dates work and will only cost you half the price of an AAnytime award ticket. AAnytime (most miles): The AAnytime Awards are available year-round regardless of the season. Awards comes with Priority AAccess boarding. You can also make any changes to your flight for free. 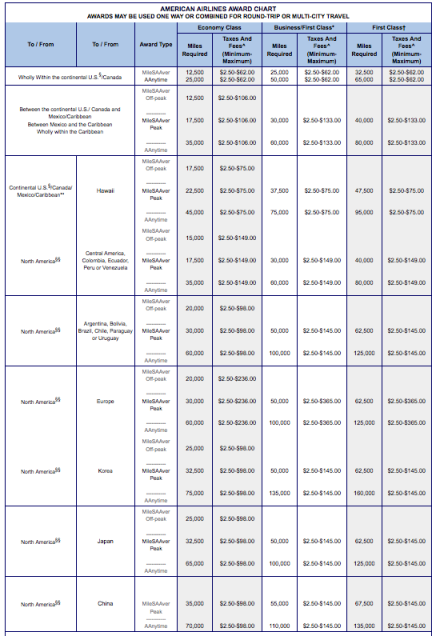 Based on the three available award prices, the one that will maximize your awards the most are MileSAAver Off-Peak. You can save up to 50% if you select Off-Peak awards compared to the other two award levels. Booking American Airline miles using the Oneworld Explorer Chart is a great way to maximize your miles on international flights. However, with this chart, you are only able to book with the 13 Oneworld Partners rather than with any of the “other airline” partners that American Airlines is affiliated with. What makes this chart great is that the awards are distance based meaning that you can travel to several cities on very few miles. Your award must include at least two segments that are on one of the 13 Oneworld alliance airlines (not American Airlines). You are also limited to maximum of 16 segments, but that can be more than enough to create a Round the World award with multiple stops! A segment consists of each flight that from start to finish. For example, if you are flying to Istanbul with Air Canada from Los Angeles, you will probably have a connection in Montreal and then fly direct to Istanbul. Your flight to Montreal is one segment and your flight to Istanbul is a second segment. The Round the World tool is a great way to help you plan your itinerary. In order for the Round the World award to be allowed, the itinerary can include up to 16 segments and stop in 3 regions. Here is an example of a Round the World itinerary that begins in Los Angeles and goes eastward. My “final” itinerary had to be modified for a few reasons and they could very well save you miles to extend your trip to see more places around the world. On this RTW itinerary, I included a flight from Vienna to Istanbul, however all of the flights will connect through London via British Airways or another airline. Since I have no interest in stopping in London, I will essentially be wasting a segment and paying for pricey fuel surcharges. Instead of connecting through London, I checked off “surface sector” which means that I will be traveling to the next city with a different means such as a cheap airline like Pegasus, rental car or bus. Remember that the Oneworld Explorer chart is zone based, so the mileage you are going to be charged is based on the distance you’ve flown within a zone level. In this example, the distance flown is 25,053 miles and falls into zone 8. Zone 8 costs 140,000 miles on economy which is a good deal for a RTW trip, however, if you can make some adjustments to some of your segments and drop at least 54 miles, you will fit into Zone 7 which requires 120,000 miles for economy. The best way to maximize your awards for international flights is to use the Oneworld and other Airline Award Chart because you can book Off-Peak awards and you have 25 partner airlines available to fly on! Off-Peak Awards are not available for Asia Zone 2, the Middle East or the South Pacific. 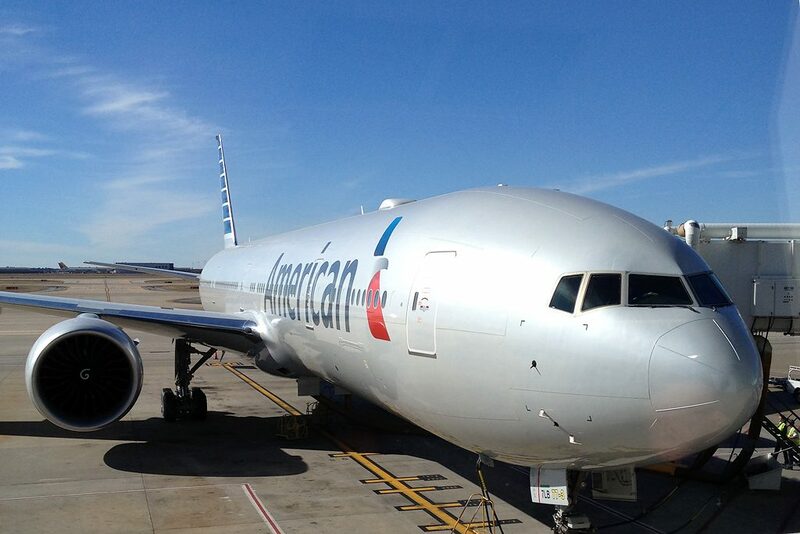 Stopovers and open jaws are one of the best way to maximize you American Airlines miles. For one, they give you a chance to make an extra stop at a North American city either on your way to an international destination or on your way back. With American Airline, you can have a stopover on one-way and roundtrip awards. However, they must be at a North American International Gateway City and the trip must include an international destination. American Airlines allows one stopover per one-way or roundtrip award. Rather than only having one stopover, you can book your award as two separate one-way awards with a stopover on each. This will allow you to have two stopovers per round trip! 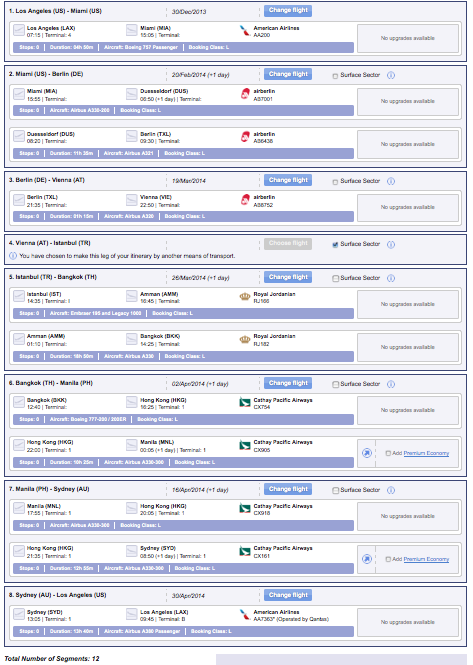 Booking separate one-ways awards also lets you add open jaws. An open jaw allows you to fly into one city and departure from another, but you will need to travel between the two on your own. For example, you fly to Rio de Janeiro from LAX, but return to LAX from Buenos Aires, thus making this an open jaw. Say for example, before heading to Brazil you will like to spend a week in Mexico city, which is an international gateway city. You are allowed to fly into Mexico City from any airport in the US that has connecting flights and because you’re intended destination is international, you can fly to Brazil from Mexico. Your stopover in Mexico City will not cost you any extra miles. To make a reservation with an American Airline partner you have to call into the American Airline reservation telephone line. The availability for partner airlines is not provided on the American Airline website with an exception for Alaska Airlines and affiliate airlines that include American Eagle and American Connection. 1. 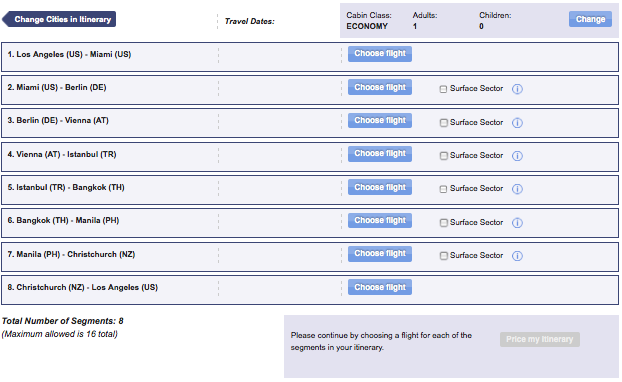 Search oneworld.com or on partner airlines website for the schedule you want. 2. Save the flight number, time and date of flight, and the segment number of the flight. 3. Call the American Airline reservation line to finalize your award at (800) 433-7300.